Thank you for being here to share in this divine service. It is designed and dedicated to celebrating and giving praise to God for the bountiful grace and several favours that He so generously lavished on our late brother Stephen Seepersad. It was that grace and favour that enabled him to live a full, productive, community-based and God-fearing life for the benefit of his fellow men and earned our total respect and admiration. May I also thank the bereaved Seepersad family for the privilege accorded to me to attempt to present on their behalf some sentiments on the rich and varied legacy of their late father, grand-father, husband that hopefully will help to allay our sorrows and be a model for posterity. We also will recall, during this eulogy some of those cherished memories and moments and the varied and rich legacy bequeathed to us by our late brother and dear friend, Stephen Seepersad. In the socio-educational landscape of East Trinidad a great gap and void has now arisen. That gap will be difficult to bridge and to fill from the passing away of the late Stephen Seepersad. A great icon and role model has left his DNA in the footprints on the sands of time. His legacy will endure forever most notably at Hillview. Thousands of his students mourn his sad demise. To the thousands who mourn and are weighed down by his sad demise I say to you that we must derive respite and solace from the fact that he lived a full, fulfilling and selfless life. That he was a good and faithful servant of the Lord. That he regarded his life as a precious gift from God. That his innate talents were a trust from God - mustard seed capital that he developed and invested for the benefit of humanity. Steeve adequately fulfilled his several calling. He is now worthy of entering the Kingdom of heaven; for that is the reward of the poor in spirit and those who are pure in heart. He allowed his intellectual and spiritual light to shine brightly and widely for the benefit of men and women that led to their salvation. Stephen Seepersad like the Apostle Paul "fought the good fight", finished the course and kept the faith. Steeve was a caring educator, devoted churchman, avid sportsman, community-based philanthropist. He blended the uniqueness of his unique, unassuming human personality with the simplicity and humility of one who rose from very humble beginnings while he lived in Maingot Road. He refused to be restricted by the walls of mediocrity. He worshipped in this Church for the best of sixty years. He served as a spiritual Elder for 50 years and participated in the work of the major boards of the Presbyterian Church. His spirit will pervade this sanctuary for a long time to come. He was a true friend, mentor and benefactor of thousands. He was not capable of being the enemy and doing harm to anyone that I know of. I first met our late brother Steeve, as he was affectionately known to us, on 17 January 1962 when I joined the Staff of Hillview College as an A'Level Teacher. That was the beginning of a true friendship and an association that grew warmer and closer to our mutual benefit. Our common future unfolded as we worked together at Hillview and welded us to this growing community. He inspired and motivated me to reach for the stars but to keep my feet always firmly planted to the ground. It was not surprising that Steeve as one of his dying wishes requested that his eulogy be delivered by someone representing the Hillview Community. That inn itself tells a thousand tales of his close connexion and synergy with Hillview College. From 1961 when he joined the staff of Hillview College to his sad passing away a few days ago on Monday morning, the Hillview Community constituted his extended family. The Hillview ethic and spirit- the Hillview imperative- the prevailing norms and values as implied in the Motto - Nihil Humani Alienum - flowed in his cardio-vascular system. As the current Principal. Leslie Mahase, said on Monday, Stephen Seepersad framed the cultural and social mores of Hillview. His whole being beginning 1961 was student-centred and Hillview driven. He served as teacher, dean, Vice-Principal, Principal and Chairman of the Administrative Committee. He lovingly touched and shaped the lives of all those who passed through the portals of Hillview College. He was held in very high regard by fellow teachers and students as one person from whom they came to expect justice, love and care for the human personality. That sentiment was expressed by Presiding Elder and current Chairman of the Administrative Committee. Mr Larry Kowlessar. The late Stephen Seepersad ushered in the Golden Period from 1981 to 1988 when Hillview erupted unto the national stage as a Top Performing, Scholarship-winning School. Seventeen scholarships were won by Hillview students. One of the distinguishing attraction about Steeve was that he was never impulsive in his decision-making and inter-personal relations. He exuded the essence and modus operandi of a calm and collected administrator. That is why so many willingly gravitated to him. They were impelled by his quiet, soft-spoken and magnetic personality when they needed help and wise counsel. I must share an experience that took place Saturday last in Miami that was related to me by his dear wife Berla. During his last recent visit to Miami for urgent medical attention Steeve was diagnosed by doctors to be terminally ill. He had two days to live. He could not and indeed refused to eat or drink anything on Saturday last as they prepared to return home. Berla said that she had to fool Steeve into believing that he had to attend a function at Hillview College that evening upon his return and that he had to be strong to do so. I was told that Steeve immediately ate what was offered to him and his whole demeanor changed. That is what I meant when I said that he was Hillview-driven. For him teaching was a vocation through which knowledge can be imparted and love can be sown. Stephen Seepersad had a profound influence and impact on the lives of many stretching from his youthful days spent at Maingot Road, Tunapuna, at the Aramalaya Presbyterian Church, from Hillview College, at Mt. 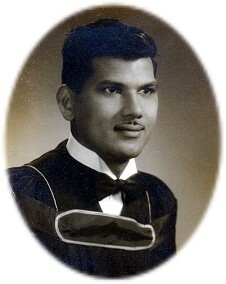 Allison University in Canada, at Mona Jamaica, from the pulpits of the several Presbyterian Churches where he did lay preaching, at the El Dorado Consumers Co-operative, cricket clubs and the Savannah Drive neighbourhood in Trincity where he was pampered by a wide circle of genuine friends and caring neighbours. He even became a faithful chela of an enlightened Political Pundit and Guru who lives in his Savannah Development and who espoused the tenets of new politics. That erudite Leader in the Wilderness is with us today to bid farewell to his disciple, great friend and supporter later on this programme. From talking to his daughter Mavis I learnt that he was a very caring father who in her words "showed enormous character as a protective father". She recalled the occasion when with his brother Neil had undergone extreme difficulties with salvaging their Accountancy School. Her Dad stood with Neil shoulder to shoulder to ride out the turbulence. He never uttered a word of criticism to Neil for mistakes that were made in a commercial venture that went wrong. But his son Neil survived to make his Dad very proud by his business success in the form of Primis Corporation that has offices across the Caribbean including Miami. Thank you Berla, Neil and Mavis for sparing no effort to look after our Brother Steeve. Neil, Mavis and Burla accompanied Steeve to Miami via Air Ambulance for his last medical consultation. There medics told him that nothing could be done to save or prolong his life any further. His family was with him every step of the way. Steeve was a founding member of the Maingot Road Sumatee Sabha, Vice-Chairman of the El Dorado Consumers Co-Op, Honorary Old Boy of Hillview, Honorary Hillview PTA Member, former member of the Public Service Commission and member of both the Secondary and Primary Education Boards of the Presbyterian Church. In 1990 he was conferred with a National Award Medal of Merit Gold for his contribution to Education and Community Development. One of his proudest achievements occurred in 1992. He was appointed a member of the Commonwealth Observer Team under Former US President Jimmy Carter that monitored the 1992 Guyana Elections. The bereaved family of our late brother has requested me to thank all friends, extended family members and members of the public for their overwhelming support, prayers, sympathy, messages, telephone calls and kind sentiments that meant a lot to them in their moment of sadness and the traumatic loss of their loved one. They especially want to thank those who have traveled from abroad to be here today to pay their last respects and homage to our dearly departed brother. They are indebted to the medical personnel who attended to Steeve and those who made special arrangements to facilitate his travel abroad and return to Trinidad. Thanks to those who participated in the pre-funeral prayer services especially the Ministers and Presiding Elders. What will buoy us up, Comfort and Sustain Us Now in Post- Seepersad Era? What is essence is his legacy and lesson for us who now face a social, economic and financial meltdown of unprecedented proportions? Steeve has taught us that the core values of simplicity, humility, devotion to community building, family cohesiveness and service to humanity in the name of the Almighty are enduring, sustaining and superior to the pursuit of materialism. That is the legacy that must provide us with a margin of comfort and provide solace as we mourn his loss and his return to his Maker.